Abi Bali Resort Villa & Spa is located in Jimbaran, the beach is only a short walk away, while the nightlife and entertainment of Kuta is a 15 minute drive. 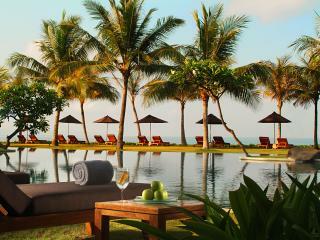 This Bali accommodation offers guests a choice of rooms and villas. 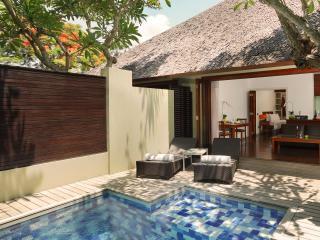 All villas feature a private pool and full kitchen facilities, whilst the rooms all feature beautiful outdoor bathrooms. Rejuvenate your body and soul with the ultimate experience at the day spa or relax with an authentic meal from the Abi Bali Restaurant. 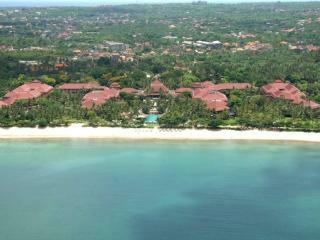 Other facilities include a fitness centre and a shuttle service to Kuta and Jimbaran. Located in the heart of Kuta's shopping scene, five minutes from the Ngurah Rai International Airport and a short walk to Kuta Beach, is Adhi Jaya Hotel. The property features 75 spacious and comfortable rooms, and facilities include a day spa, restaurant and bar, and a swimming pool. Adhi Jaya location makes it the ideal choice to experience the culture of Bali on your next family holiday or romantic getaway. 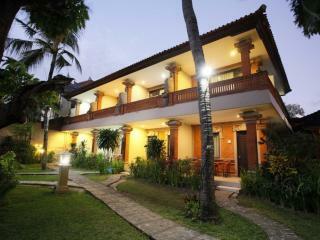 Adi Dharma Cottages offers a great location not far from the International Airport and the beach. This Bali accommodation has easy access to surrounding entertainment, nightlife, local markets, shops, restaurants and bars. With on 37 rooms Adi Dharma Cottages has an intimate setting with deluxe resort style facilities including a swimming pool, restaurant & bar plus WiFi. 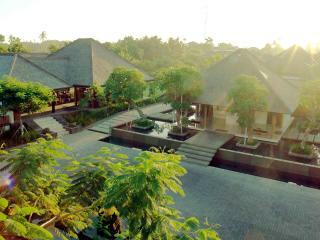 Guests have access to all the facilities at the sister property Adi Dharma Hotel. 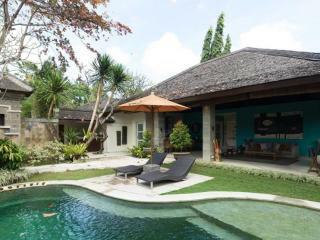 This Bali accommodation for couples, families or small groups of friends seeking an affordable holiday in Bali. Adi Dharma Hotel is set in downtown Kuta and offers easy access to nearby restaurants, markets, nightlife, entertainment and the beach. The hotel boasts a tranquil swimming pool & day spa, restaurant & bar plus a range of cultural activities. AlamKuKul Boutique Resort is ideally located across the road from the sunset beach at Legian, and is only a short walk to the cafes, restaurants, bars and shopping of Kuta and Legian! 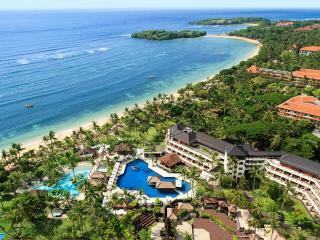 This Bali resort offers guests a choice of rooms and thatched roof villas that are set amidst lush tropical gardens. 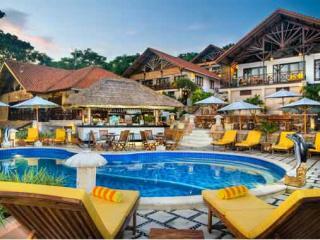 Facilities include a restaurant and bar, café, a day spa, a gift shop, two swimming pools and a kid's pool. Alaya Deduan Kuta is surrounded by a choice of shopping, dining and entertainment venues that are all within convenient walking distance. 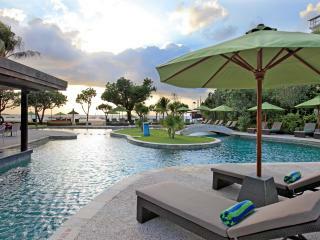 Bali's Ngurah Rai International Airport as well as the legendary Kuta beach are both just minutes away. Each villa is set within its own garden compound that features a swimming pool, outdoor leisure space and convenient gourmet kitchen. Facilites include Deduan Restaurant, DaLa Spa, a library, private butler service and travel and tour assistance. All Seasons Resort Legian is located between the popular Kuta and Seminyak shopping and entertainment districts, just 15 minutes from Ngurah Rai International Airport and a short stroll from the famous Legian Beach. All Seasons Resort Legian offers guests a total of 113 rooms, each featuring Balinese décor and some offer views over the swimming pool. 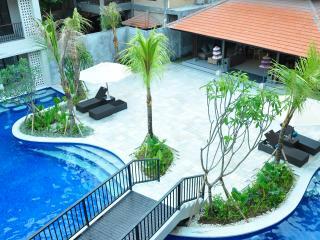 Facilities include an outdoor swimming pool, trendy restaurant, bar and internet. 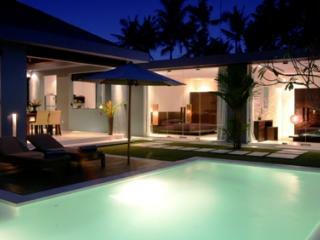 Located about 35 minutes north of Kuta, is Ametis Villa Bali in Canggu. Canggu is a great alternative to Kuta and Seminyak, as it is more relaxed and offers guests a slower pace of life away from the hustle and bustle, but still enjoying great beaches and surf breakfs! Spacious open air villas feature private swimming pools, sun decks and lounges and full kitchen facilities. There is also 24 hour butler service, 24 hour wifi connection, a restaurant, lounge and day spa. 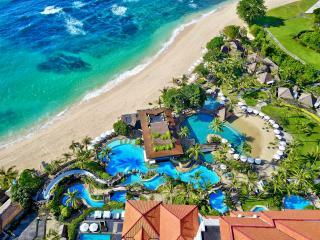 Ananta Legian Hotel is the perfect choice for your next getaway to Bali. A 5 minute walk will have you relaxing on the beach, or spend your days enjoying the nearby shops, bars, restaurants and cafes of Legian. Facilities at Ananta Legian Hotel include a restaurant and bar, swimming pool and complimentary wifi connection. 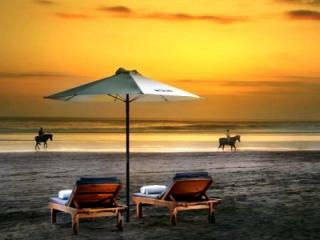 The nightlife of world famous Kuta and the boutique shops of Seminyak are also only a short drive away. Anantara Seminyak Bali Resort is located only a short walk from beach, restaurants, boutiques and the hip nightlife of Seminyak. 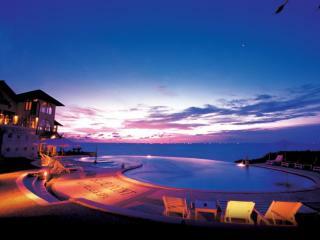 This property offers guests 59 suites that features modern comforts and panoramic views over the Indian Ocean. Enjoy the Balinese culture and unique island experience while staying at the Anantara Seminyak Bali Resort, ideal for your next Bali holiday on your honeymoon or with the family. 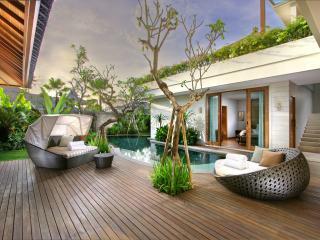 Astana Kunti Suite Apartment & Villa is located close to the restaurants, shops and cafes of Seminyak. Petitenget Beach is 5 minutes away, and the International Airport is also 25 minutes drive from Astana. This Bali accommodation offers guests a choice of 28 suite rooms and 19 villas, with each featuring full kitchen facilities and tropical gardens. From your base at Astana Kunti Suite Apartment & Villa you are also within easy reach of the Elephant Caves, Ulundanu Water Temple and Klungkung Royal Palace. A beautiful and unique sanctuary found on the beach at Legian, Away Bali Legian Camakila boasts 117 rooms that have their own balcony, lush tropical garden views and air conditioning. An elegantly styled resort, it combines traditional style with modern simplicity. Facilities include a Day Spa, 2 swimming pools, 2 restaurant and bars and direct beach access. Located right in the heart of Legian, Away Bali Legian Camakila is the ideal place to base yourself on your next romantic getaway or holiday to Bali. Bali Court Hotel & Apartments is just 20 minutes from Ngurah Rai International Airport, and is conveniently located only a short walk to Legian Beach. This Bali accommodation consists of hotel rooms and 1 & 2 bedroom apartments that feature balconies or verandas and are set around two linked swimming pools. Facilities include a restaurant and bar, laundry service and massage service. Also located close by are restaurants, shops and bars and exciting nightlife. 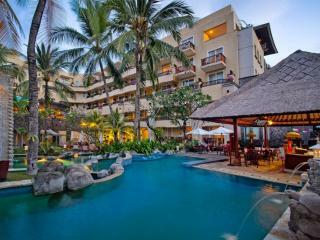 Bali Dynasty Resort is centrally located within walking distance to the nightlife and excitement of the central Kuta area. Facilities at this popular Bali Resort include a Day Spa, Kids Club, Teens Club, restaurants, bars, three swimming pools, swim up pool bar, adults only lazy pool and dedicated kids pool with waterslide. 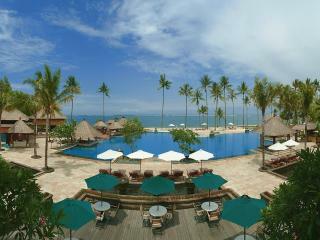 Bali Dynasty Resort is ideal for families and couples. Bali Island Villas & Spa is located within the vibrant area of Seminyak, only a two minute stroll to the Petitenget Temple and Petitenget Beach, and only 10 minutes to the attractions of Kuta. This Bali accommodation comprises 10 self contained luxury 1 bedroom villas, each with their own lap pool and rooftop garden. Some of Bali's best restaurants and shopping are located only a short stroll away, making this the ideal choice to base yourself on your next family holiday or romantic getaway. Bali Kuta Resort is ideally located only 5 minutes from the beach at Kuta, 15 minutes from the International Airport and approximately 15-20 minutes from the boutique shops, restaurants, bars and cafes of Legian and Seminyak. The property has 251 rooms with balconies that overlook the gardens, pool or city. Facilities include a restaurant, bar and pool bar, day spa, swimming pool and 24 hour room service. The heart of Kuta is only moments away and offers a vast array of shopping, night life and entertainment for the whole family. 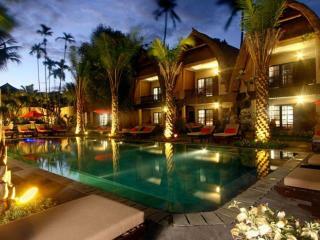 Bali Niksoma Boutique Beach Resort is located in Legian and is surrounded by spectacular lush tropical gardens. The resort is only 15 minutes drive from Bali's International Airport and within walking distance to the markets, shops and nightlife of Legian and Kuta. Bali Niksoma Boutique Beach Resort offers guests a choice 54 rooms and suites that are tastefully decorated in a tropical style. Facilities include a stunning 2 level swimming pool and restaurant with breathtaking views of the ocean, restaurant and bar, gymnasium and sauna and a boutique gallery. Bali Rani Hotel is situated at Turban, South Kuta only a 10 minute drive from the International Airport and a short walk from shopping and the restaurants and bars of Kuta. The beach is located across the road and is accessible by foot. 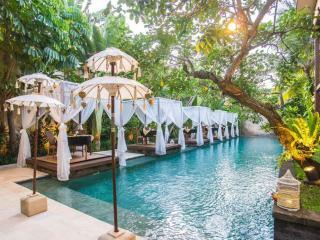 This Bali accommodation offers guests a choice of 104 rooms, each featuring views over the lotus pond and swimming pool. Facilities include a swimming pool, spa and massage treatment rooms, 24 hour room service and a restaurant and cafe. 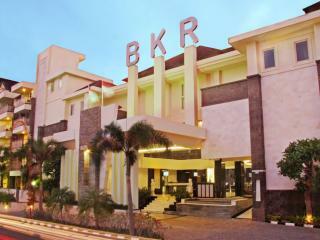 Bali Rani Hotel is also located close to Waterbom Park, directly opposite Discovery Shopping Mall and Stadium Cafe. 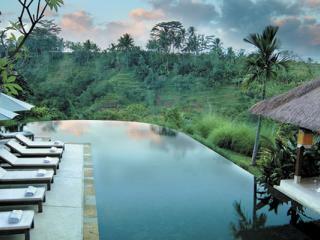 Beji Ubud Resort is a boutique resort situated in the green hills of Ubud overlooking the Sewah terraces and river. 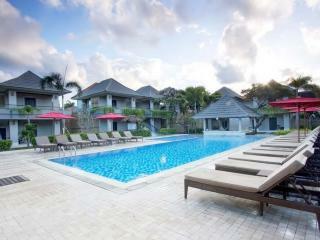 This Bali resort offers affordable accommodation in Family Rooms, Deluxe Garden Rooms and Lumbung Villas. Facilities include a restaurant and bar, swimming pools, car and bike hire and tours and excursions can be arranged. Beji Ubud Resort is and ideal choice for those looking for a quiet place where you can totally relax but would also like to be near beautiful shops and restaurants. Besakih Beach Resort is surrounded by beautiful gardens, and is only 20 minutes from Bali's Ngurah Rai International Airport. Each bungalow is a combination of traditional Balinese architecture and modern features such as air conditioning, satellite television and a private terrace or patio. Facilities include 2 swimming pools, 2 Restaurants, 24 hour room service and a massage service. 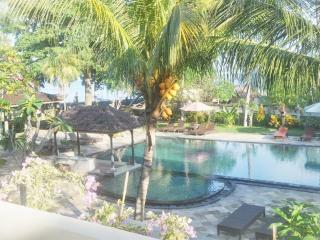 This Bali accommodation is deal for couple or small families after a relaxing place to stay in Sanur. Bhavana Private Villas are only minutes away from Seminyak beach offering spectacular sunsets which can be viewed from delightful beachside cafes and bars. 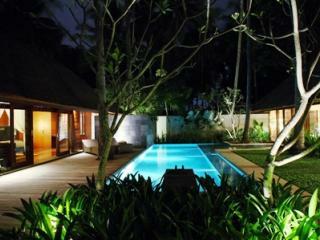 This Bali accommodation offers sixteen private villas set in immaculate walled gardens each with a private pool. Seminyak is a mixed tourist / residential area on the west coast of Bali just north of Kuta and Legian where you will find high end shopping, combined with many fine eating establishments. 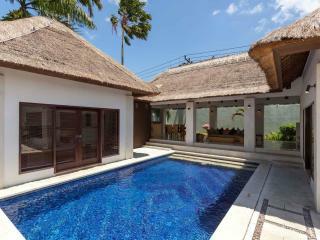 This Bali accommodation is an ideal choice for families and couples who want to be close to the beach. Bintang Bali Resort offers a beachfront location in Tuban, South Kuta and is close to an array of restaurants, bars, nightlife and shops. 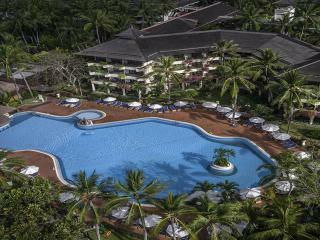 The resort boasts a wide range of facilities including a large swimming pool, fitness centre and a free kids club. Blue Point Bay Villas & Spa is situated on top of a cliff, on the southern shore of Bali, at Uluwatu and offers extreme views of Bali and the Indian Ocean. Blue Point Bay Villas & Spa is located 20 minutes from the airport and 2 kms from the impressive Uluwatu temple, where Balinese gather to celebrate Purnama, or full moon. This Bali accommodation consists of 30 villas and 30 deluxe rooms which has been designed to harmonise with the surrounding environment and reflect the true elegance of Balinese artistry. There are two large pools on the property, one set at the edge of the cliff for a truly unique swimming experience. Food choices include Pan-Asian cuisine as well as Mediterranean, seafood and barbecue choices and dining accommodations can be enjoyed in a restaurant setting or in the privacy of your own room. Bounty Hotel is popular with young holiday makers due to its great location and fun, party atmosphere. This Bali accommodation offers a fantastic central location in the heart of Kuta, perfect for those who want to be close to the nightlife, multiple restaurants & bars, shops and the beach. 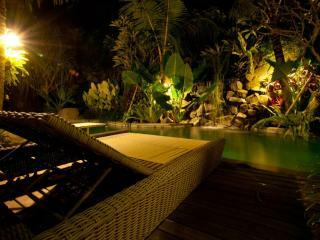 Facilities at Bounty Hotel include 2 swimming pools, all night party music and entertainment and a 24 hour poolside bar. Looking for a great place to holiday with family or friends? Look no further than Bvilla & Pool. Located 5 minutes from the beach, and a short distance from "Eat Street" in Seminyak, you will be spoilt for choice with ample restaurants, bars, cafes and boutique shops at your fingertips! There are six 2 bedroom villas that feature open air living, full kitchen facilities, butler service and a private swimming pool with sun lounges. On-site facilities include a large swimming pool, complimentary shuttle service to Kuta, Legian and Seminyak and spa facilities located at Bvilla & Spa, a short walk away. Bvilla & Seaside offers guests a choice of nine 1, 2 and 3 bedroom villas that are ideally located 140 metres from Seminyak Beach. From here, you are also within walking distance of a vast array of restaurants, bars, cafes and boutique shopping of Seminyak, or a short drive away is the nightlife, beaches and shopping of Kuta and Legian. Facilities at Bvilla & Seaside include butler service, complimentary shuttle service, free WiFi and day spa treatments at Bvilla & Spa. Bvilla & Spa is ideally located in Seminyak, close to Petitenget Beach, and a short distance from the boutique shops, restaurants, bars and cafes. 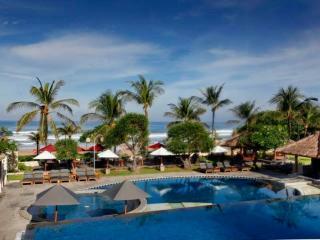 The tourist hubs of Kuta and Legian are also easily accessible from Bvilla & Spa. Guests can choose from 1, 2, 3 and 5 bedroom villas that feature full kitchen facilities, a butler service and private swimming pools. There is a complimentary shuttle service that will drop you into Legian, Seminyak and Kuta, and free WiFi access. Located in Seminyak, 5 minutes away from Kudeta beach and close to an endless array of shopping and renowned dining venues, C151 Smart Villas are perfectly designed for privacy and comfort, are fully serviced and equipped with an impressive range of state-of-the-art conveniences. From one to three bedrooms, with well-appointed kitchen, bar, dining area and a stunning private swimming pool with under water speakers, these villas will provide the ultimate holiday experience. Facilities include C151 cabana club, gymnasium, car and bicycle rental and private butler service. 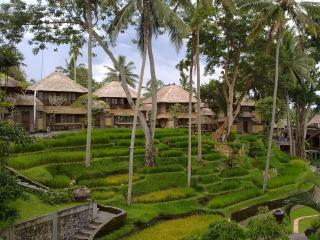 Surrounding the complex are picturesque rice fields enhancing the already relaxing atmosphere. Danoya Villa - Private Luxury Residences is also only a few minutes from the beachfront and just one kilometer north of the fashionable shopping, wining and dining district of the Oberoi. 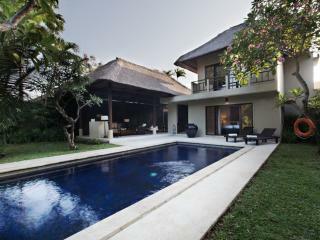 The twenty villas (1, 2, 3 & 5 Bedrooms) are a unique blend of Mediterranean and Balinese features. Stylish furnished and appointed, guest are guaranteed to enjoy their stay in comfort, privacy and luxury. All guests have access to the high-class service and facilities, such as 24 hour security, 24 hour front desk and laundry service. 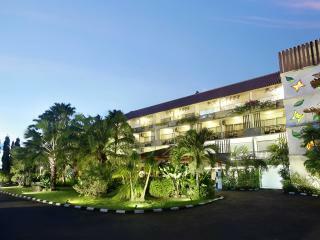 Dewi Sri Hotel is popular with the young at heart, due to its excellent value and fun atmosphere. This boutique budget Bali accommodation is located in the heart of Kuta, just off Jalan Legian and provides comfortable hotel rooms, a lovely swimming pool and a 24 hour poolside restaurant and bar. Discovery Kartika Plaza Hotel offers a wide range of outdoor activities, a large swimming pool with swim-up bar, children's pool, free kids club, onsite restaurants, theme night dinners and its very own Discovery Shopping Mall. Located on the beachfront of South Kuta Beach, Discovery Kartika Plaza Hotel offers a mix of room accommodation including Suites and Luxury Beachfront Villas. Only walking distance from Kuta shops, restaurants and entertainment facilities, make Discovery Kartika Plaza Hotel conveniently positioned for holidays, international conferences and incentives. Downtown Villas is perfectly situated just 2 minutes walk from the heart of Bali's trendy & chic district of Seminyak, a 20 minute drive from Bali International Airport, and a 10 minute walk from famous Kuta Beach. This Bali accommodation offers guests a choice of 1, 2 and 3 bedroom villas, each with its own 20 metre swimming pool (1 bedroom villas feature a private plunge pool). Facilities include a full room service menu and a gymnasium. Downtown Villas is an affordable villa style property, close to shopping and restaurants of Seminyak and within easy reach of most tourist attractions and business addresses in Bali. 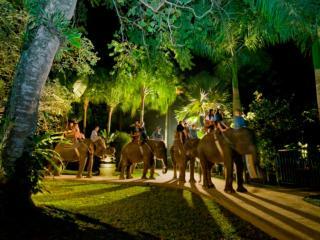 The Elephant Safari Park & Lodge is located in the historic village of Taro, just 25 minutes north from the island's cultural and artistic centre of Ubud and 90 minutes from the International Airport. Set within 3.5 hectares of the multi award winning Elephant Safari Park, this Bali accommodation features a private purpose built 27 room safari style lodge which offers a world exclusive experience to interact, feed, ride, observe, learn, play and stay with beautiful Sumatran elephants, one of the most rare and endangered species of elephants left in the world today. Other facilities include a day spa, restaurant and bar, swimming pool and fitness centre. Furama Villas and Spa, Ubud, Bali offers an amazing location southwest of Ubud the villas are surrounded by the rice fields at Banjar Bindu and features views of paddy fields and Mount Batur in the distance. Facilities include Spa Furama, a swimming pool and 24 hour room service, where you have the option of dining from the comfort of your villa. Alternatively the Padi Restaurant offers panoramic views of the adjoining rice fields, an extensive wine list and mouth watering menu. FuramaXclusive Ocean Beach, Seminyak Bali is located on a palm fringed beachfront at Legian Beach, near the resort destination of Seminyak. Offering guests a choice of rooms and suites over 5 levels, this Bali accommodation is beautifully appointed and offers convenient access to most of the tourist attractions. 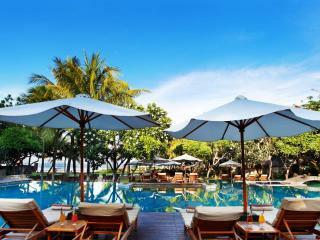 FuramaXclusive Ocean Beach, Seminyak Bali is the ideal base for your next family holiday or romantic getaway to Bali. Surrounded by tranquil padi fields, The FuramaXclusive Villas & Spa offers stylish villas set around a lagoon with their own dip pool or outdoor spa bathtubs. 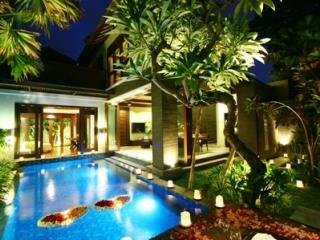 Villas are spacious and designed in a contemporary style with an Asian touch. Decorated with wooden furnishings, villas feature a large bedroom with en-suite bathroom and a living area. Indulge with a session at the spa that will help you relax and feel rejuvenated with their menu of massages and body treatments. Other facilities include a swimming pool, tour desk and various cultural programmes. Enjoy a meal at FuramaXclusive's on-site restaurant with panoramic views of the surround padi fields. For a more private meal, in-villa dining can also be provided. For light refreshments and cool drinks, head to Lagoon Pool Bar or Bistro Suling. 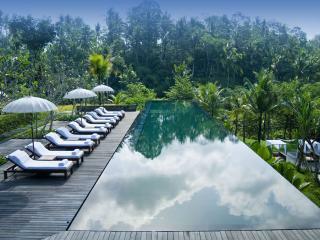 Gending Kedis Luxury Villas & Spa Estate has breathtaking views over a steep wooded ravine with lush green surroundings. Offering guests a choice of nineteen 1, 2, 3 and 4 bedroom villas, each featuring its own swimming pool, modern kitchen and spacious living areas. Facilities include 24 hour villa service, a day spa, restauarant and bar and a main swimming pool. Grand Barong Resort is located 300 meters from Bali's surfing beaches, in close proximity to Kuta's nightlife and shopping areas. A lively destination, right in the centre of entertainment, it is a popular zone for the young at heart. There are 99 guestrooms, fully furnished with all the modern amenities to ensure a comfortable and enjoyable stay. Onsite facilities include massage, doctor on call and restaurant with International cuisine plus its convenient location simply make for the ideal paradise getaway. Offering a 24 hour swimming pool, pool bar and restaurant, it will definitely provide an entertaining stay. Grand Istana Rama Hotel has an excellent location directly opposite Kuta Beach and a short walk to the shopping, restaurants and nightlife that Kuta is famous for. Facilities at Grand Istana Rama include a large swimming pool, pool bar, restaurant and a terrace cafe which overlooks the beach. 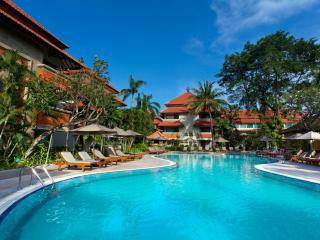 Grand Sinar Indah Hotel is located in Legian away from the bustle of Kuta yet close to Bali's shopping area. 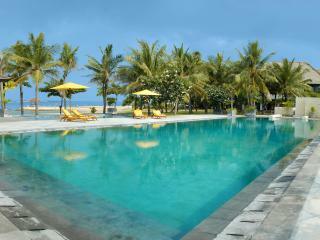 It is only short walk to Legian beach and 40 minutes from Ngurah Rai International Airport. The Grand Sinar Indah offers affordable accommodation in Deluxe and Superior rooms, each facing the swimming pool and tropical gardens. Everything you need for an enjoyable holiday is right at your fingertips at Grand Sinar Indah Hotel. Griya Santrian is renowned for its beautiful landscaped gardens, swimming pools, personal touches and friendliness of the staff. 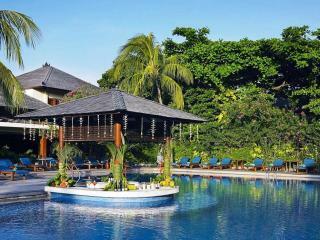 This lovely Bali resort offers guests a choice of 98 comfortable rooms, surrounded by lush tropical gardens. Griy Santrian is centrally located on Sanur Beach, within walking distance to the shops and restaurants that line the main street of Sanur, and only a 25 minute drive to Denpasar's International Aiport. 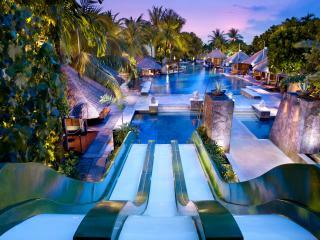 Hard Rock Hotel Bali appeals to guests looking for a fun atmosphere, quality service and facilities. Hard Rock Bali is located in the heart of Bali's entertainment and shopping districts of Kuta Beach and facilities include Bali's largest free-form swimming pool, a sunken bar, kids club, spa and health centre and endless entertainment including the main bar - Centrestage which offers live entertainment every night. Hillstone Uluwatu Villa is located in Ungasan, south of Bali, just a 20 minute drive from the International Airport and 15 minutes to an ancient Uluwatu temple. 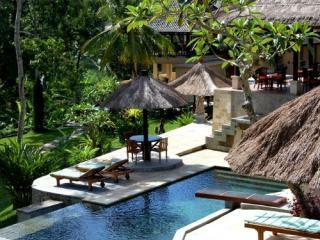 Each of the villas is surrounded by private landscaped gardens, and has a swimming pool and a Balinese-style gazebo. Facilities include a swimming pool and pool bar, a fitness centre, spa and massage facilities, and business centre. 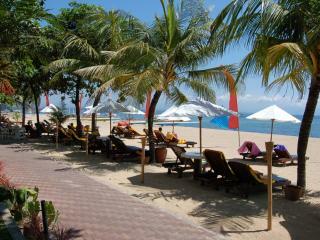 The resort also provides shuttle bus service to and from Dreamland beach. 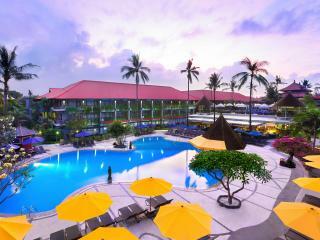 Combine family fun and relaxation at Holiday Inn Resort Baruna Bali. Children will love the activities at Rascals kids' club, while you pamper yourself with a massage in one of the Tea Tree Spa's tranquil pavilions on the beach. This Bali accommodation offers guests a choice of 195 rooms with each featuring view of the tropical gardens or Kuta Beach from the balcony. Holiday Inn Resort Baruna Bali is 10 minutes from Denpasar International Airport and only a short stroll along the water's edge to downtown Kuta. Looking for that perfect right hand reef break in Bali? 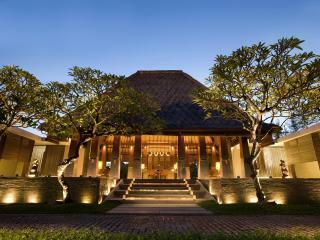 Hotel Komune Bali is approximately a 30 minute drive north of Sanur on the south east coast of Bali. Here you will find a world class reef break, a newly opened resort with great onsite facilities including a pool, beach club bar and restaurant, outdoor grass cinema and WiFi Internet connection. Rooms are affordable, stylish in design and feature all the modern conveniences need for a relaxing surf holiday. 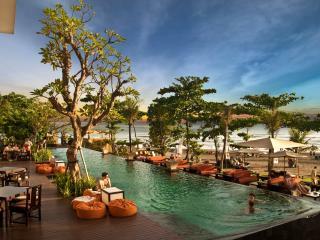 This Bali hotel offers a fantastic beachfront location in Legian and is home to 2 swimming pools, restaurant and bar. Hotel Puri Raja is an affordable accommodation choice for those looking to base their next Bali holiday, with easy access to shops, markets, restaurants, bars, entertainment, attractions and the beach. The affordable Hotel Puri Raja boasts spacious rooms with modern fittings. 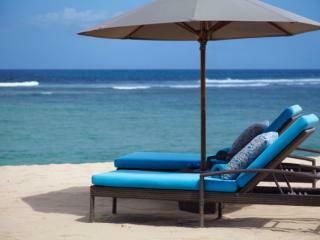 Relax, unwind and enjoy Bali. 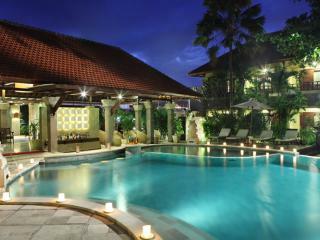 Hotel Tjampuhan & Spa located approximately 45 minutes from the International Airport in Denpasar. This Bali accommodation is surrounded by tropical gardens and set on the beautiful banks of the Tjampuhan River in the village of Ubud. The hotel was built in 1928 for guests of the Prince of Ubud, and features 67 rooms that have private balconies overlooking the gardens. From you base at Hotel Tjampuhan & Spa, you can explore the many attractions nearby including the Kings Palace and Monkey Forest, the Puri Lukisan Museum of Balinese Art, and traditional former market. Hotel Vila Lumbung is a small boutique style resort located near the diverse mix of restaurants that Seminyak offers, 20 minutes from the heart of Kuta and just an 800 metre walk to the beach. Facilities at Hotel Vila Lumbung include a large 2 level swimming pool with waterfall, lotus pond and cave, Day Spa, a beautiful restaurant with many garden terraces and an adjacent pool bar. This Bali accommodation offers an great location just 10 minutes' walk from the popular Kuta Beach and close to an array of restaurants, shops, markets and entertainment in Legian. 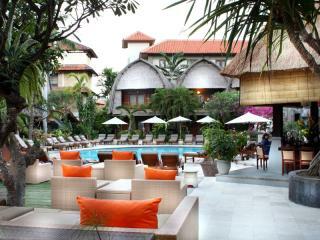 Ida Hotel Bali Kuta is a budget hotel with only 50 rooms in downtown Kuta yet offers a peaceful and tranquil setting. Enjoy the use of the onsite facilities including the restaurant, outdoor swimming pool and massage services. Perfect for couples or families travelling on a budget, Ida hotel boasts a range of spacious room types to choose from for your next Bali getaway. Impiana Private Villas Seminyak Bali Hotel & Spa is a unique Bali hotel, conveniently located in the heart of Seminyak, within walking distance to shops, top quality restaurants and the beach. Each Villa has it's very own private swimming pool, sunbathing area, private entrance, tropical manicured gardens and fully equipped kitchen. Impiana Private Villas Seminyak is the ideal Bali resort for guests looking for peace and privacy on their next Bali holiday. Enjoy relaxing stays with spectacular sunsets, fantastic surf right at your door and exquisite French inspired food when you stay at Indiana Kenanga Hotel & Spa. Accommodation choices includes 2 Villas with private pools and tropical gardens, and 6 suites with private gardens, that feature a mix of French design and Balinese decor. Facilities include a day spa, an outdoor pool and beachfront restaurant. 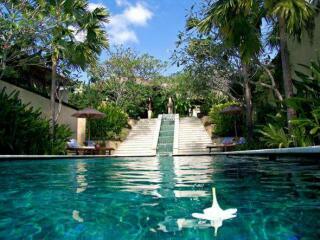 Indiana Kenanga Hotel & Spa is located at Nusa Lembongan, a 25 minute boat ride from the main island of Bali. 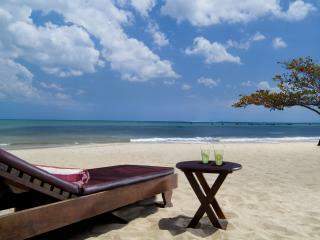 This Bali accommodation boasts a fantastic location on the beach in the Sanur Region. 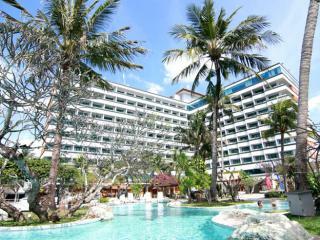 Inna Grand Bali Beach Hotel, Resort & Spa is perfect for those who enjoy being located close to the beach but also having easy access to entertainment, attractions and shopping. This Bali resort features great facilities that are ideally suited to couples or families including tennis courts, 4 swimming pools, mini golf, shopping arcade and more. 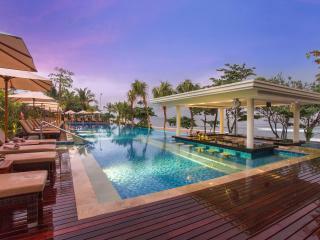 This Bali accommodation boasts a stunning waterfront location on Jimbaran Beach. InterContinental Bali Resort features over 400 rooms and suites that are ideal for a family holiday or romantic getaway as a couple. The kids can enjoy the Planet Trekkers Kids Club while the adults can relax by one of the 6 swimming pools with cocktail in hand. Kamandalu Resort & Spa is located in Ubud approximately 1 hours drive from the International Airport and 10 minutes drive from Ubud centre. Surrounded by lush green hills, terraced rice paddies and tropical forests, this all villa accommodationis built on the curving ridges above the Petanu River. 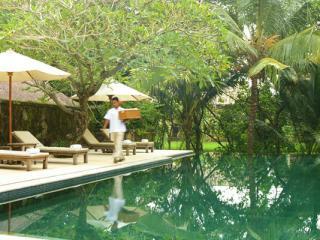 Facilities include a restaurant and bar, swimming pool, day spa and complimentary scheduled shuttle service to Ubud. The location of Kanishka Villas is away from the crowds of the clubs, yet close to the shopping and dining venues in Seminyak. 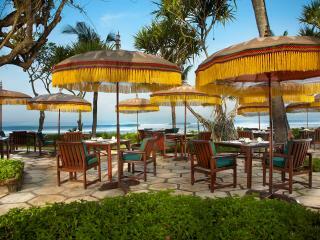 Tanah Lot Golf Course, Bali Golf Country Club and Seminyak Beach are also close by. This boutique resort is about 15 minutes drive from Ngurah Rai International Airport and is also close to Seminyak Beach. 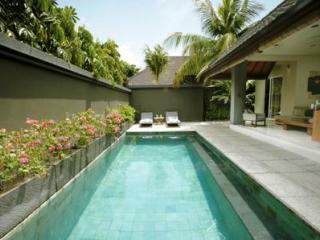 Kanishka Villas feature 15 one and two bedrooms villas that are extremely luxurious. 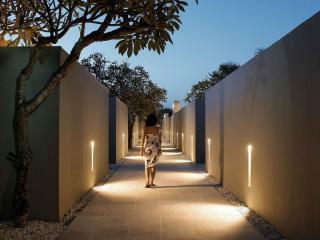 Each villa is spacious with gorgeous interiors and beautiful lighting. The villas features private swimming pools, fully equipped kitchens, open style dining and living area with large sofas for relaxing. With close proximity to boutique shopping, restaurants bars and cafes of Seminyak, Kayu Raja Villa is the ideal place to base yourself and your family to experience the beauty and culture of Bali. There are 58 one and two bedroom villas, each featuring private pools, open air living and dining areas and fully equipped kitchens. 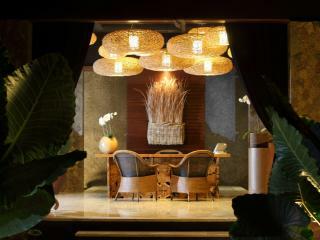 Facilities include a day spa, restaurant and bar, and a complimentary shuttle service to Kuta, Legian and Seminyak. The international airport is approximately 30 minutes drive from Kayu Raja Villa and Kuta and Legian are 10 minutes away. Kayumanis Jimbaran is located within a short drive from Bali's International Airport on Bali's southern coastline, in Jimbaran. Some of Bali's revered temple shrines are within a short distance of the property as well as charming shops and seafood restaurants. 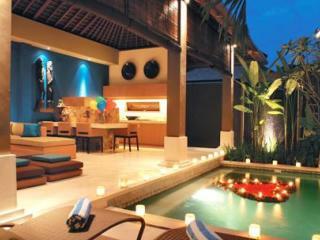 All villas are spacious, and decked out in a various theme such as Balinese, Primitive and Modern. Each villa features a private pool and an open air garden bath. 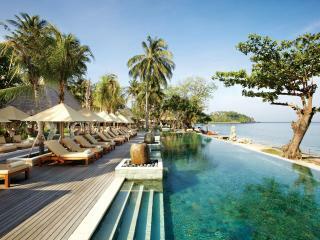 The resort also houses one restaurant and world-renowned spa facilities. Tours to nearby attractions and activities like cooking lessons can also be arranged. As one of Bali's original all-villa properties, Kayumanis Sanur Private Villa & Spa is hidden away down a quiet back lane in the village of Sanur. It is resplendent of a traditional community composed of private villa units featuring 1, 2 & 3 bedrooms. Each spaciously appointed villa is secluded with a charming landscaped compound highlighted by a personal swimming pool and Balinese lounging pavilion that exposes the delights of tropical outdoor living. 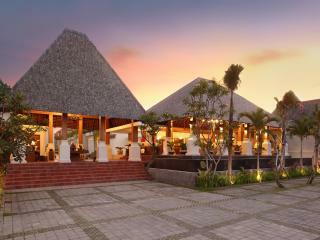 Facilities include Gong Restaurant, day spa, beach club and daily cultural activities. 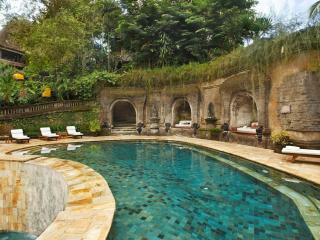 Kayumanis Ubud is located in the heart of Bali's mystical vliiage, Ubud. 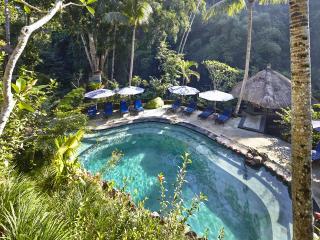 Overlooking the tropical forest and Ayung River, this Bali Resort is the ideal choice for those seeking complete privacy. 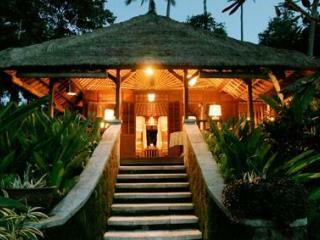 Kayumanis Ubud has 23 themed villas. Facilities include a day spa, and several dining options to suit every guests culinary preference, from a memorable romantic candle-light dinner within the privacy of your villa, to a sumptuous Thai lunch al fresco, Kayumanis Ubud is sure to delight even the most discerning traveller. Kelapa Luxury Villa is situated on the north-west corner of Gili Trawangan in a coconut plantation, a 2 hour boat ride from the mainland of Bali, and 10 minutes from Lombok Island. Each 1, 2, 3 and 4 bedroom villa offers a private secluded garden and swimming pool. Facilities include an onsite masseuse, 24 hour security and room service. Guests have the option of being able to explore the island by bicycles provided, or on foot as Kelapa Luxury villas is only a short stroll from dive facilities, restaurants, bars and white sandy beaches. Kembali Villas are ideally situated in Seminyak, an array of shops, entertainment and restaurants are within easy reach of this Bali accommodation. Kebali Villas are perfect for couples, families or groups after villa style accommodation that is close to Semikyak beach which is just 5 minutes walk away. Each villa features a full kitchen and private swimming pool. Located right on the beachfront at Jimbaran Bay, Keraton Jimbaran Resort & Spa is a boutique property built in the style of a Balinese palace. 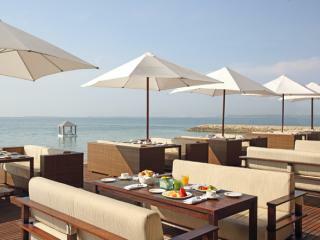 Guests are within walking distance of the white sandy beach, the famous Jimbaran beachfront seafood market. 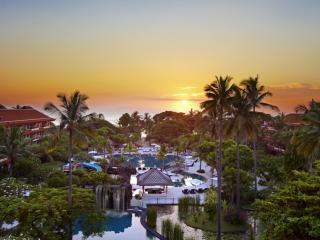 The 102 elegant rooms are tastefully funished and are located within the magnificent tropical gardens. 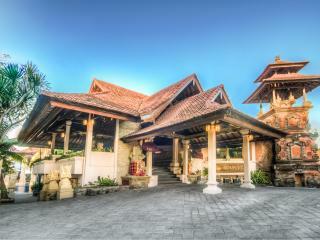 The resort is ten kilometers from the airport and a short drive from Garuda Wisnu Kencana and Uluwatu temple. 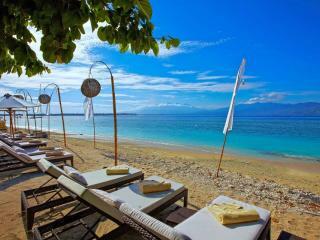 Ko-ko-mo Gili Trawangan Resort offers guests a choice of luxurious 1, 2 and 3 bedroom villas right on the beach of Gili Trawangan, one of the 3 islands located off the northwest coast of Lombok, approximately a 2 hour boat ride from the mainland of Bali. All villas include spacious living areas, private swimming pools or jacuzzis and there is a in-room dining service available from the fine dining restaurant on-site. 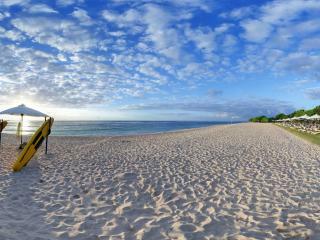 Gili Trawangan is an idyllic tropical island paradise with beautiful clear turquoise water and white sandy beaches. Kokonut Suites is located on the beachside at Seminyak, with a picturesque backdrop of the rice fields and coconut trees. The hotel offers guests 34 one and two bedroom suites which feature spacious interiors and beautiful views. 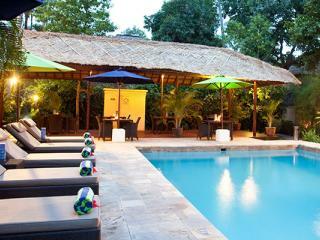 Facilities include a uniquely shaped swimming pool, resort spa, Livingstone Restaurant, bar and pool lounge and gym. Located 20 minutes from the International Airport and a short drive to various tourist attractions like Monkey Forest, Bali Bird Park and Reptile Park, Kokonut Suites is the ideal destination for your next romantic getaway to Bali. Located on the hillside by the Campuhan River Valley, Komaneka at Bisma is a 10 minute walk to the centre of Ubud. Komaneka at Bisma offers quality accommodation and friendly hospitality. Guests can visit Bali's attractions such as Tanah Lot, Jimbaran, Taman Ayun, Legian and Lovina during their stay at the hotel. Komaneka at Bisma features 34 suites and 9 villas, with each villa featuring a private plunge pool and terrace. All rooms and villas are equipped with amenities such as telephone, television and a private bathroom. The onsite restaurant serves Indonesian and international cuisines for its guests. Guests can also enjoy a drink and a light snack at the lobby lounge, restuarant or pool bar. Komaneka at Monkey Forest is located in the centre of Ubud, just off Monkey Forest Road and close to the markets and restaurants. Komaneka at Monkey Forest is a small boutique hotel offering guests a choice of Suite Rooms and Pool Villas, and great onsite facilities including a day spa, restaurant, pool bar, and swimming pool. 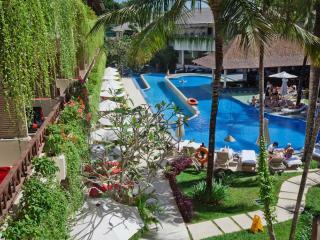 This Bali resort is the ideal choice in affordable accommodation for your next family holiday or romantic getaway. 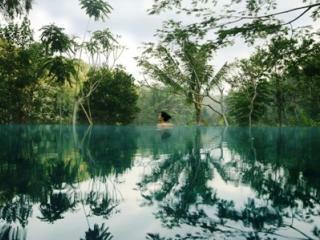 Komaneka at Tanggayuda is only 15 minutes from the centre of Ubud and just over an hour's drive from Kuta and Legian. Accommodation choices at Komaneka at Tanggayuda include Garden Villas with private courtyard or Pool Villas with their own private plunge pools. 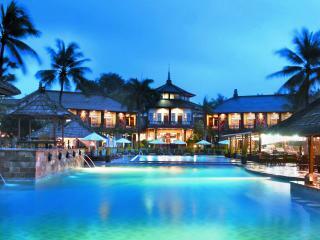 Facilities include a Day Spa, Warung Kudus Restaurant, the Terrace Cafe and a swimming pool. From here, you can easily access the temples, cultural performances, museums, artists' villages, galleries, shops and restaurants that this region is famous for. Kuta Paradiso Hotel is surrounded by tropical gardens, and is located in the heart of downtown Kuta, the International Airport is just 10 minutes away, and a short drive from Legian, Nusa Dua and Sanur. Facilities include a free-form swimming pool, lap pool and terrace bar, business centre, restaurants and bars. 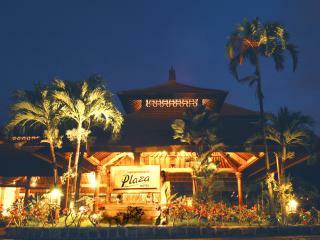 Kuta Paradiso Hotel is also located close to the restaurants, amusement centre and nightlife entertainment areas. Le Jardin Boutique Villa is located in Seminyak on the west coast of Bali, only 200 metres from the beach and a 20 minute drive from the International Airport. Situated among dining and nightlife options, the villas are fully self-contained, and feature an open-plan kitchen, living and dining areas with direct views to a private swimming pool and garden. The bedrooms are spacious and complete with en-suite bathrooms. Guests can choose to unwind at the health spa, work up a sweat at the gymnasium or explore the surrounding attractions by going on day trips and tours, which can be arranged from the hotels tour desk. Legian Beach Hotel is located directly on the beachfront at Legian, just minutes from the shopping, restaurants and nightlife of Kuta. There is a wide array of accommodation types to choice from including thatched roof bungalows and spacious hotel rooms, all set amongst lovely tropical gardens. Facilities include 2 swimming pools, restaurants and bars, kids club, tennis and squash courts, spa and massage and a beauty salon. Lembongan Island Beach Villas is a fantastic resort located on the hillside, overlooking Jangut Batu Village and across Badung Strait, right up to the peak of Mt Agung, the highest mountain in Bali. 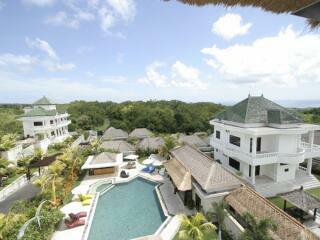 This Bali accommodation consists of 1, 2 & 3 bedroom self-contained private villas, featuring views over Lembongan Bay. Lembongan Bay is home to a number of famous surf breaks including Playgrounds, Lacerations and Shipwrecks. Facilities include a tropical poolside bar, convenience store, restaurant, snack bar and BBQ area. Lembongan also has a large range of bars and restaurants within walking distance, including a number of barefoot beach bars and cafes in the village. Maca Villas & Spa Seminyak is located a short distance from the beach at the northern end of Seminyak, close to restaurants, boutique shopping, bars and cafes, and only a 25 minute drive from the International Aiport at Denpasar. This Bali accommodation offers guests a choice of 1 and 2 Bedroom Villas, with each featuring their own private swimming pool and butler service. 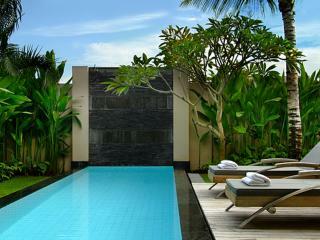 Facilities include a day spa, 20 metre lap pool, restaurant and bar and complimentary shuttle service to Seminyak. Mahagiri Villas & Spa Dreamland is located in Ungasan, close to Uluwatu and about 20 minutes from Nusa Dua and Jimbaran Bay and a 30 minute taxi ride from the shopping, restaurants and bars of Kuta! Uluwatu is also the site of the most famous temple in Bali - it is perched high on a cliff and is a must see for visitors to Bali. This Bali resort offers guests a choice of 1 and 3 bedroom private pool villas that feature a beautiful garden shower, and living and dining areas. Guests have the option of having their meals prepared in the privacy of their villa or you can experience some local cuisine at the onsite restaurant. Other onsite facilities include a day spa and gymnasium. Ideally located within walking distance of some great surf beaches, including Uluwatu Beach and and Suluban Beach, is Mamo Hotel Uluwatu. 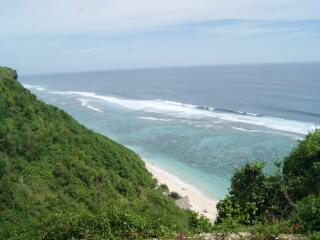 From here you are also a 10 minute walk from Dreamland Beach and Uluwatu Temple. This Bali resort offers guests a choice of rooms over 3 levels, all featuring modern furnishings and views over the villages, ocean or pool. Facilities include a restaurant, swimming pool and laundry services. From Mamo Hotel Uluwatu you are also approximately a 40 minute drive from the tourist hubs of Kuta, Legian and Seminyak. Maya Ubud Resort & Spa is located 10 minutes from Ubud Village, and is built into the hillside and offers panoramic views over the rice fields, local villages and the Petanu River valley. This Bali accommodation caters well to couples, romantic interludes and honeymooners, with beautifully furnished Superior Rooms, Superior Garden Villas and Deluxe Pool Villas. 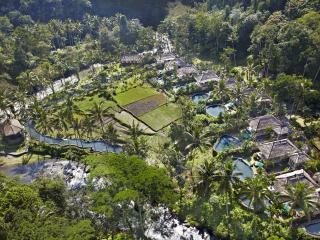 Maya Ubud boasts a spectacular Spa Pavilion set amongst the rainforest on the banks of the Petanu River. Other facilities include 2 restaurants, a riverside café and bar. Melasti Beach Bungalows & Spa is set amongst lush tropical gardens, and is ideally located on the beachside at Kuta Beach, just a five minute drive from the International Airport, and close to Kuta Centre Mall, Waterbom Park and Kuta night life. Facilities include swimming pools, 24 hour room service, day spa and laundry service. Rooms at this Bali accommodation feature private luxurious marble bathrooms with shower and tub and some rooms also have balconies with views over the gardens. Melasti Beach Resort & Spa is located in the heart of Legian, within walking distance to many shops, restaurants and entertainment venues. 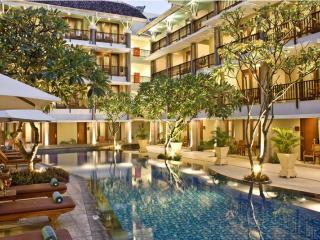 This Bali accommodation is ideal for those wanting to be close to the action. The rooms at Melasti Beach Resort are surrounded by tropical gardens and facilities include a swimming pool with swim up bar, children's pool, tennis courts, spa, child minding & playground facilities. 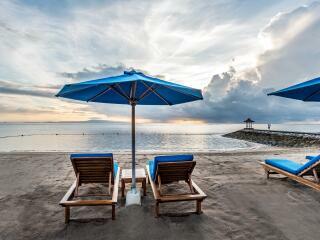 Mercure Resort Sanur - Bali is a fantastic choice in affordable accommodation located right on the beach in Sanur, only a short drive from Kuta, Seminyak, Legian and the International Airport at Denpasar. This Bali accommodation offers guestrooms that are situated in 41 traditional two storey cottages and feature private balconies or terraces. 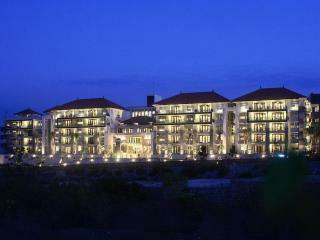 Facilities include 2 swimming pools, a day spa, kids club, tennis court, a restaurant and 3 bars. 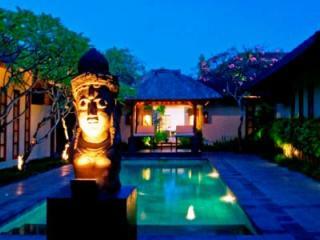 Mutiara Bali Boutique Resort & Villas is situated in the heart of Seminyak, a 30 minute drive from the International Airport and is surrounded by fashion boutiques, art galleries, dining and nightlife. 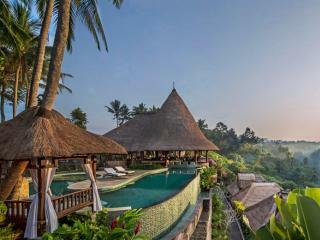 This Bali accommodation comprises 20 resort rooms and a number of private villas. Facilities include a gym, spa, swimming pool, restaurant and day spa. With just a short walk to the white sand of Seminyak Beach, The Mutiara Bali Boutique Resort & Villas is highly recommended for couples and families due to a gorgeous bay with safe waters, and will be the highlight of your stay on your next family holiday or romantic getaway to Bali. Just 30 minutes from Denpasar International Airport and only 10 minutes from Seminyak Beach, Nunia Boutique Private Villas is ideally located in the dining, shopping and entertainment district. 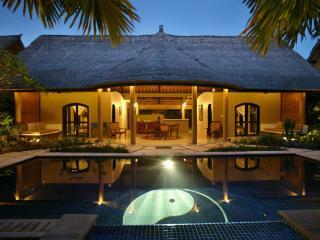 Accommodation features self-contained villas boasting their own private pool, gazebo and sundeck. The comfortable village style accommodation at Padma Resort Legian is set in beautifully landscaped gardens and surround a large swimming pool. 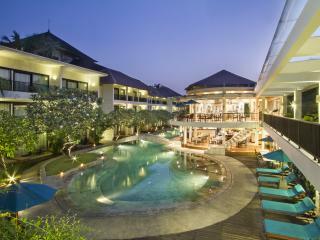 Padma Resort Legian is located right on the famous Legian Beach, away from the hustle and bustle of Kuta. Facilities include a Kids Club, Day Spa, children's pool, sunken pool bar and a range of restaurants. The hotel is just 15 minutes from the airport, and between 5-10 minutes to the centre of Kuta, shops, restaurants and entertainment spots. Pat-Mase Villas is a villa style property surrounded by tropical landscaped gardens, 2 minutes from Jimbaran Beach on the southern tip of Bali. 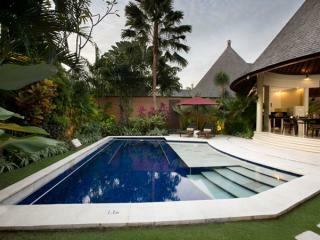 There are 20 self contained 2, 3 and 4 bedroom villas that all feature a private pool. Facilities at this Bali accommodation include a restaurant, in villa dining, a shuttle service to Kuta and Jimbaran Beach and massage services. Pelangi Bali Hotel & Spa is located right on the beach, close to the boutique shops, restaurants, bars and cafes of "Eat Street" in Seminyak. The International Airport at Denpasar is approximately 20 minutes away and the nightlife and tourist hubs of Kuta and Legian are a short 5 minute cab ride away! This affordable Bali accommodation offers guests a choice of room types, and facilities including a restaurant, swim up bar, fitness centre, spa and swimming pool. 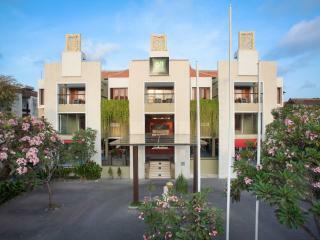 Peppers Seminyak is surrounded by landscaped gardens and lotus ponds, and is ideally located in the heart of Seminyak. Guests can choose from 1 to 5 bedroom villas, each featuring a private pool with sundeck and bale, full kitchen facilities and marble bathrooms. Facilities include a restaurant, a gym, day spa and a 35 metre rock pool. Located only 20 minutes from the airport, Peppers Seminyak is the ideal choice in accommodation on your next Bali holiday. Pita Maha Resort & Spa is situated in the Tiampuhan Valley of Ubud, overlooking the River Oos, lush rice terraces and tropical forest, only 1.5 hours from the International Airport in Denpasar. Accommodation choices of 3 traditionally thatched villa categories including Garden Villas, Pool Garden Villas and Pool Duplex Villas. Each villa is set in traditionally styled walled compounds with the Pool Garden & Pool Duplex Villas enjoying a private pool and enclosed garden. Facilities at Pita Maha Resort & Spa include a swimming pool, interactive classes in dance, music, painting and cooking, and Terrace Restaurant. 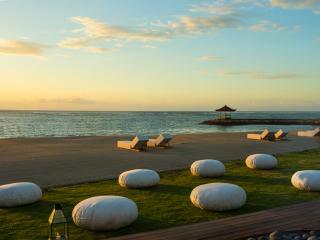 Hotel Sanur Resort offers absolute beachfront accommodation, on Bali's pristine south eastern coastline of Sanur. At this Bali resort you can sip a cocktail in the pool from the glorious swim up pool bar and enjoy views over the nearby beach at the very same time! Spa, watersports, fitness centre, shops on site, walking distance to nearby villages and markets, Prama Sanur Beach Bali really does have it all! 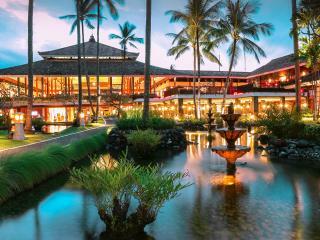 Located in the coastal village of Sanur, with Balinese-style architecture, The Sanur Paradise Plaza Hotel consists of 329 spacious and comfortable rooms, numerous restaurants and bars, modern fitness centre and traditional spa are all set around a long freeform pool and tropical garden, providing a tranquil haven for guests. The kids will be amused by the 30 metre waterslide, gaming arcade, climbing structures and the Camp Splash Kids Club, while parents relax by the pool or enjoy a massage. 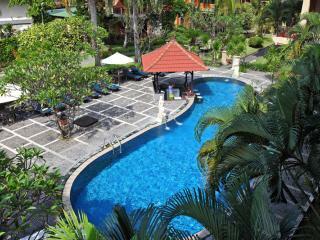 The hotel is situated close to temples, galleries, restaurants, a golf course and the very popular Sanur Beach. Prime Plaza Suites Sanur – Bali is a family friendly resort with large self contained 2 and 3 bedroom apartments and a dedicated kids club and pool. Camp Splash, the Kids Club at Prime Plaza Suites Sanur – Bali, is considered Bali's best Kids Club, featuring waterslides and all day activities. Other facilities at this Bali accommodation include a restaurant, bar, day spa, complimentary shuttle to the shopping and beach area and many complimentary resort activities. 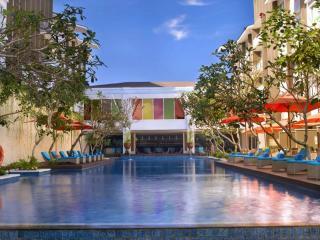 Pullman Bali Legian Beach is set in tranquil surroundings opposite Legian Beach. 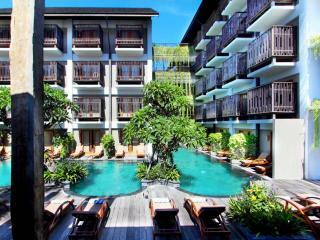 This Bali accommodation offers easy access to restaurants, shopping and nightlife. Guests can enjoy a choice of 351 impeccable rooms and suites featuring a modern design inspired by the frangipani tree. Bask in the infinity pool overlooking the ocean, visit the wellness centre or sample the offerings of the bars, restaurants and boutiques located in the hotel grounds. The comfortable Bali accommodation at Puri Santrian is set over a few hectares of beautifully landscaped gardens and has a lovely atmosphere with waterfalls and fountains throughout the resort. Facilities at Puri Santrian include four swimming pools located just off the beach, a sunken pool bar, restaurants, day spa and many recreational activities including tennis and water sports. 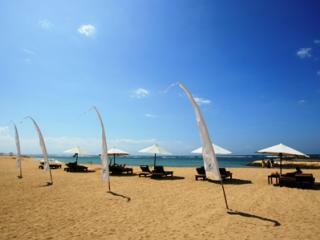 Puri Santrian offers the a great location at the southern end of Sanur Beach. Puri Saron Hotel is located on the famous Senggigi Beach in the west of Lombok, approximately a 3 hour boat ride from Bali. 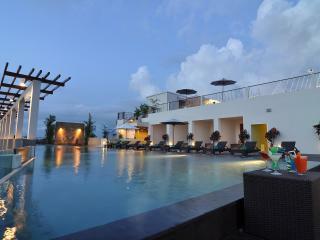 This Lombok accommodation offers guests a choice of 48 guest rooms with views over the gardens or ocean. Facilities include a swimming pool, massage and spa, restaurant and bar and Internet connection. Puri Saron Hotel Senggigi Beach is ideal for honeymooners looking for a quite getaway, or families that want to experience the culture and scenery of Bali at a more relaxed pace, and is less frequented by tourists than Kuta and it's surrounding beaches. Enjoy a paddle before breakfast, or relax to traditional music and dancing over dinner and enjoy the sunset on the beach at Seminyak. 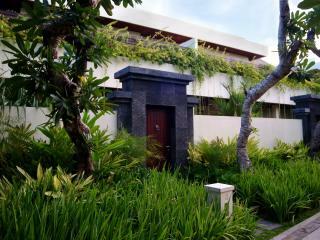 This is all yours when you stay at Puri Saron Seminyak. Located just a short stroll from the beach and 25 minutes from the International Airport, Puri Saron Seminyak offers guests a fantastic location and great facilities. 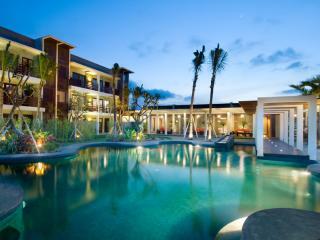 This Bali accommodation has 115 rooms consisting of Deluxe Rooms, Chalets and 1 and 2 bedroom villas. Qunci Villas are located on the west coast of Lombok, right on the beachfront in Senggigi, and is surrounded by beautifully landscaped gardens. Guests can choose from Hotel Rooms, Pool Villas and Luxury 1, 2 and 3 Bedroom Villas. Each room features a minimum of 40m² of living space and boats views of the gardens or ocean. Facilities include 2 swimming pools, 2 restaurants, a day spa, tour desk and a 24 hour on call doctor. The Qunci Villas is also a short drive to Senggigi Town with its market shopping and local eateries, making it an ideal place to base yourself to explore the island of Lombok and the Gili Islands on your next Bali holiday. 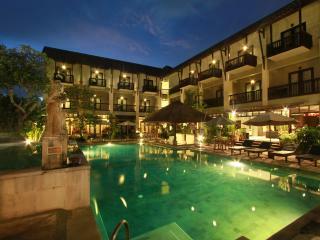 The Ramayana Resort & Spa is centrally located in the heart of Kuta, close to the shops, restaurants and nightlife. The Kuta Art Markets and Matahari store are opposite The Ramayana Resort, with Waterbom Park and the Tuban Centre close by. 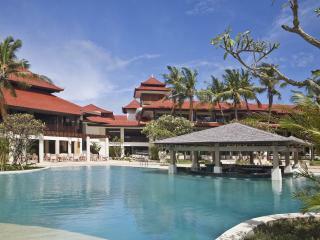 The main beach of Kuta is only a 2 minute walk away from this traditional Balinese style hotel. Facilities include 2 swimming pools, restaurants, a day spa and resort club lounge. Risata Bali Resort & Spa is ideally situated just five minutes drive from Bali's Ngurah Rai International Airport and within walking distance of all the main shops, restaurants and vibrant nightspots. All of the rooms are surrounded by lush tropical gardens with fragrant flowers, exotic fruit trees and shady palms; while the magnificent white sandy beach, renowed for its rolling waves and breathtaking sunsets, is a mere 100 metres away. The Segara Village Hotel is built and designed around the concept of a Balinese Village and comprises five distinct villages within the six hectare resort complex. Ideal for your family Bali holiday or romantic getaway, The Segara Village Hotel is positioned on the beachfront, set amongst tropical gardens exuding a feeling of spaciousness seldom found at other Sanur Resorts. 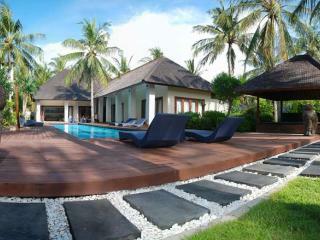 Sun Island Boutique Villas & Spa is situated in a private compound, featuring 23 individual villas. Located only a few minutes drive from the beach, Kuta and Legian, and only a short stroll from the dining and shopping precinct of Seminyak. 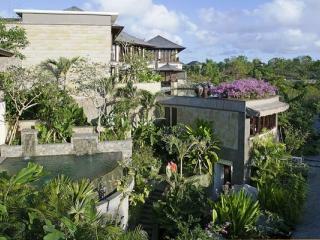 Each Villa is self contained and features a living and dining area that open into the private garden and plunge pool. Relax at the Day Spa or head into Kuta for some shopping, or head to one of the bars and experience a spectacular sunset. Taman Bebek Bali is a luxury resort located in the tropical village of Ubud, about an hour's drive from the heart of Bali and the international airport. Offering guests an array of room options, each is large and modern with a distinct attention to the traditional styles of the area. Facilities include an art gallery cafe and infinity swimming pool. Taman Bebek Bali is relaxing and your stay will be memorable, as you are surrounded by real Balinese culture with the mountains and eastern fishing villages on your doorstep. 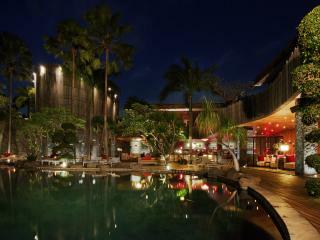 Taum Resort Bali is a new property located in the heart of Seminyak, close to beaches, shopping, restaurants, bars and cafes. 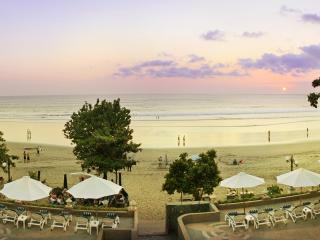 Kuta and Legian are also within easy reach making it the ideal place to base yourself to explore the beauty of Bali. The property offers guests a fantastic choice of rooms and suites, with some featuring private plunge pools. 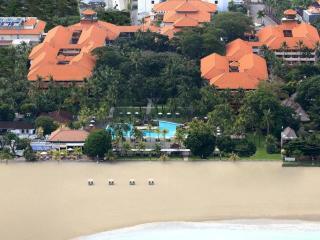 Facilities include a swimming pool and children's pool, day spa, restaurant and bar, a fitness centre and beauty salon. 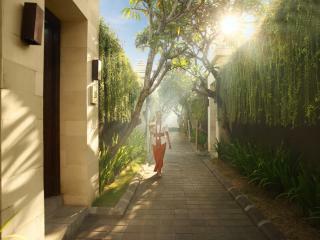 The Ahimsa is situated in the heart of vibrant cosmopolitan Seminyak. 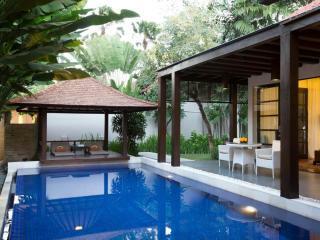 Choose from sixteen private villas, ranging from one to three bedroom pool villas. Each villa features a beautifully lit, private swimming pool with lush tropical surrounds, full kitchen facilities, state of the art entertainment systems and open plan lounge and dining areas. Services and facilities include laundry and dry cleaning services, restaurant, WiFi internet, spa services, safety deposit boxes, car parking and security guard. The Ahimsa is only 15 minutes from the Airport, 15 minutes to Sanur and the capital of Denpasar, making it the ideal choice to base yourself to explore the culture and beauty of Bali. 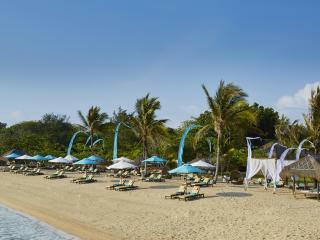 The Ahimsa Beach is perfectly located a mere stones throw from Bali's jewel in the crown, Jimbaran Bay. Known as the 'Golden Mile', this idyllic stretch of pristine sand is famous for its gentle waves, peaceful surrounds and breathtaking sunsets. Choose from eleven private villas, ranging from one to three bedrooms, with each villa featuring a private swimming pool, full kitchen facilities and open plan living areas. Facilities include 24 hours room service, butler service and massage treatments. The Ahimsa Beach is only 10 minutes from the Airport, 15 minutes to Nusa Dua and 20 minutes to Kuta and Seminyak, making it the ideal choice to base yourself to explore the culture and beauty of Bali. Just minutes away from the beach and just off Bali's most fashionable street for dining and entertainment, The Ahimsa Estate affords guests all the pleasures they seek for the ultimate Bali experience. The Estate features six luxury villas comprising of 1, 2 and 3 bedroom villas. Each property features full kitchen facilities, open plan living and a private swimming pool. 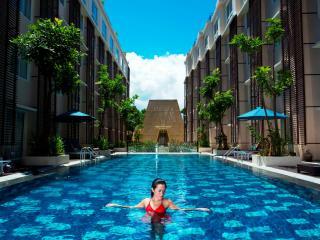 Facilities include a massage service, business centre, babysitting and a shuttle service around Kuta and Seminyak. The Akasha Luxury Private Villas is ideally located in the north of Seminyak, a mere 100 metres from the sun-kissed beach of Batubelig. Set in a quiet and exclusive surrounding, the location is few minutes away from Bali's most fashionable neighborhoods Petitenget, Oberoi and Seminyak where there is a fantastic array of shops, bars and restaurants offering plenty of choices. Guests can choose from 1, 2, 3 and 4 Bedroom self contained villas, each spacious in design and complete with their own private swimming pool. Located 25 minutes drive from the airport and 10 minutes from Kuta, The Akasha Luxury Private Villas is the ideal choice in accommodation on your next holiday to Bali. 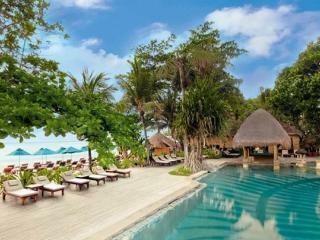 The Beach House Resort is located on Gili Trawangan, approximately 20 minutes off the coast of Lombok. The Beach House Resort offers guests a choice of rooms, bungalows and villas, with some featuring their own private freshwater pools. 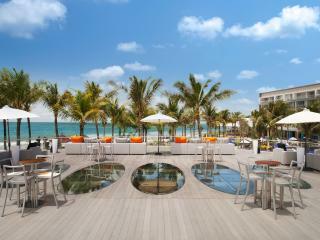 Onsite facilities include a beachfront pool and bar serving international cuisine. There is no motorised transport on the island, so guests travel via pushbike, on foot or by horse and cart. This stunning island has long white sandy beaches, clear waters and abundant reefs that are ideal for divers and snorkelllers. This Bali accommodation offers a number of facilities that are perfect for couples and families including a day spa, kids corner, swimming pool, restaurants and bars. 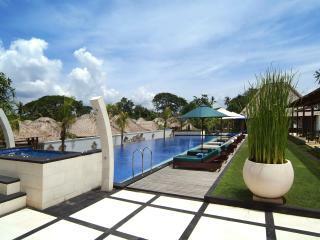 The Breezes Bali Resort & Spa is also within walking distance of shops, restaurants, nightlife and Seminyak Beach. 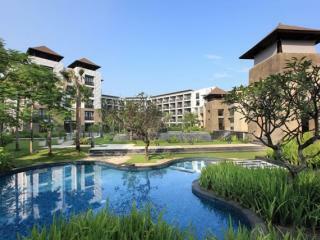 For your next family holiday or relaxing couples getaway why not stay at The Breezes Bali Resort & Spa. With a great location close to the beach, shops, bars, cafes and restaurants of Seminyak, The Dipan Resort Petitenget is ideal for a romantic getaway or family holiday to Bali. Guests can choose to stay in suites or 1 and 3 bedroom villas that feature full kitchen facilities and their own private swimming pools. On site facilities include a restaurant and bar, day spa, main swimming pool and child minding services. Kuta and Legian are easily accessible and provide endless entertainment from lazing on the beaches to fantastic shopping and nightlife! The Dusun Hotel is a boutique resort in Seminyak, offering 14 exquisite private villas and conveniently located in the Petitenget area, on Bali's southwest shore with only a few minutes stroll from the beach. Each villa at the Dusun Hotel has an exclusive entrance leading to a private swimming pool surrounded by lush tropical gardens. The Elysian Boutique Villa Hotel is a haven where you can enjoy the privacy of your own villa, complete with its own pool set amongst a leafy Balinese garden. Facilities include a swimming pool, restaurant & bar and day spa. Located in the fashionable beachside centre of Seminyak, this unexpected hideaway offers all the trappings of a fully serviced hotel. The Haven Seminyak is a lifestyle resort situated in the dynamic area of Seminyak, The Haven Seminyak is surrounded by international restaurants and bars, hip night life, fantastic shopping, and the most famous beaches are all within easy walking distance! This Bali accommodation offers guests a great choice of affordable accommodation from rooms to 1 and 2 bedroom suites and pool villas. Facilities include a Day Spa, Restaurant and bar, swimming pools and a Beach Club. 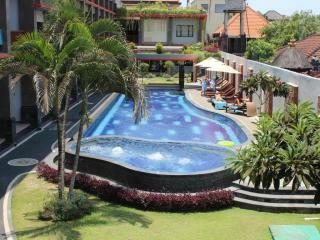 Seminyak is ideally located a short drive from the famous tourist hot spots of Legian and Kuta. The Jayakarta Bali is set amongst 11 acres of lush tropical gardens with facilities including 3 swimming pools, a Health Spa and tennis court. The beautiful beachfront resort is just a short walk to the shops and restaurants and is a popular Bali resort for for couples and family and friends groups, with both hotel rooms and apartment style accommodation available. The Kayana is located in the heart of Seminyak district on Bali's southwest coast, and is a luxurious collection of 24 villas gracefully arranged on either side of a tree lined pathway. Facilities include a Day Spa, infinity swimming pool, and a restaurant and lounge bar. Guests also enjoy access to a free shuttle service to Seminyak, and is only a 25 minute drive from the international airport. The Kunja Villas & Spa offers 18 self contained 1 and 3 bedroom private villas conveniently located in Seminyak, only minutes away from one of the island's most famous stretch of golden-sand beaches, a myriad of restaurants and shopping boutiques. 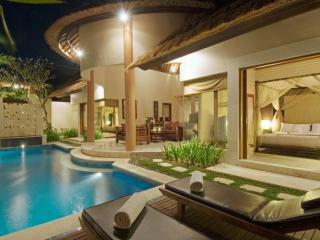 Each villa has a large central living area and private swimming pool with sundeck. Facilities include laundry and housekeeping needs, personal chef available on request and massage and spa facilities. The most visited tourist spots are Kuta, Legian, and Seminyak, along with the eastern coastal town of Sanur only 30 minutes away. The Lokha Legian Resort & Spa is ideally located on one of the most popular streets of Legian, within walking distance to the beach, fantastic shopping, restaurants and only a 15 minute drive to the international airport. Guestrooms all feature views of the pool and include state of the art amenities. Relax around the pool, and enjoy a drink from the pool bar, before heading out to dinner. 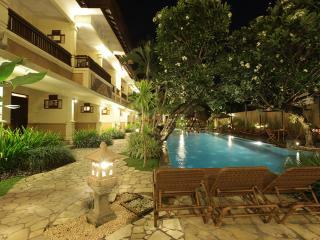 This affordable accommodation is the perfect choice to base yourself on your next holiday to Bali. The ONE Legian is located in the heart of Legian, within walking distance of the beach, restaurants, bars and cafes and shopping. The International Airport is also a short 15 minute drive away. This Bali accommodation offers guests 187 rooms and facilities include a day spa, restaurant, lounge and pool bar and a rooftop swimming pool. From your base at The ONE Legian, you can enjoy day tours and excursions to Nusa Dua, Kuta, Jimbaran Bay and the temple at Uluwatu. The Oasis Lagoon Sanur is a short 5 minute walk from the beach, and is located 30 minutes from Denpasar International Airport. 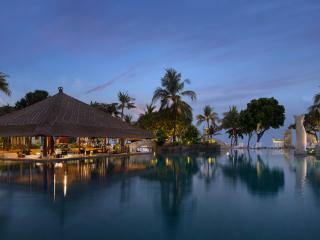 This Bali resort offers guests a choice of well appointed rooms, with most featuring views of the lagoon pool. Facilities include day spa facilities, a restaurant, lagoon swimming pool, free WiFi and an exercise room. 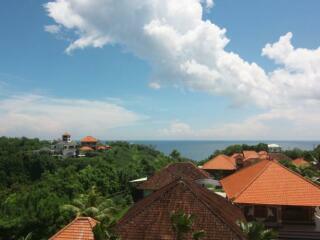 The shopping, restaurants, bars and nightlife of Kuta and Legian are approximately a 25 minute drive away. Built in traditional Balinese style, The Oberoi Bali resort offers a secluded cluster of luxury lanais and villas where you can relax in privacy under the charming thatched roof and enjoy the exquisite interiors featuring Balinese art. 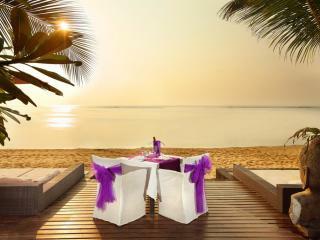 Gentle sea breezes drift through The Oberoi Bali laden with sweet smelling frangipani, hibiscus and bougainvillea. The One Boutique Villa offers guests spacious open plan 1 and 2 bedroom villas that feature large private swimming pools and full kitchen facilities. This Bali accommodation is located within close proximity of the beach, restaurants, bars, cafes and boutique shopping of Seminyak, and Kuta and Legian are only a short drive away. Guests can enjoy free wifi and unlimited transport to the Kuta area by private car. The Patra Bali Resort & Villas is a family friendly resort located on the southern end of Kuta Beach, only 5 minutes from the entertainment and shopping area of Kuta. This traditional Balinese style resort is set amongst beautiful tropical gardens and offers a Kids Club, Day Spa, swimming pools, restaurants and bars. This Bali accommodation is set in a fantastic location in South Kuta, with an array of shops, markets, attractions, restaurants and nightlife all within a close distance of the hotel. The Rani Hotel & Spa features Deluxe Rooms that are suitable for couples or small families boasting a private terrace or balcony, air conditioning and more. Guests can enjoy the use of the onsite facilities including a restaurant, bar, swimming pool and massage services. The Royal Beach Seminyak Bali - MGallery Collection is an excellent beachfront property within walking distance to shops as well as some of Bali's hottest dining and nightlife venues. The hotel is surrounded by gardens and beaches, and feature two outdoor pools and a Day Spa, which offers a wide range of relaxing treatments and therapies incorporating the local traditions. With exceptional service and a long list of amenities, The Royal Beach Seminyak Bali - MGallery Collection is an experience not to be missed. 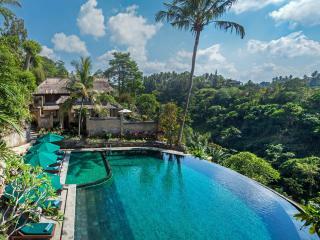 This Bali accommodation offers a stunning location in Ubud and boasts over 50 amazing villas to choose from. The Royal Pita Maha is ideally suited to those who was relax and enjoy the natural surroundings plus make use of the great facilities available including swimming pools, restaurants and lounge. Couples and families are most welcome at this Bali accommodation. The Samaya Seminyak is a stunning resort located directly on the beachfront, close to trendy restaurants, shops, lounges and bars that Seminyak offers. Guests can choose from a choice of luxury villas, all elegantly appointed with private pools and situated within two hectares of tropical gardens. The Seminyak Suite Private Villa is only 20 minutes drive from International Ngurah Rai Airport and within walking distance to the beach. Nestled down a secluded quiet lane this Bali hotel is also just moments away from a great range of shopping, dining and exciting nightlife options. The Seminyak Suite Private Villa offers guests tastefully designed 1, 2 and 3 bedroom pool villas, each set within its own personal garden compound, featuring a private swimming pool and all the necessary home comforts. The Ungasan Clifftop Resort Bali is perched 150 metres above the Indian Ocean on limestone cliffs on Bali's most southern tip at Uluwatu. Located approximately 25 kilometres from Denpasar's International Airport and 40 minutes drive from Kuta, this stunning resort provides the ultimate hideaway for guests seeking relaxation and privacy. This Bali accommodation features villas with ocean views and plunge pools and ensuites that include indoor and outdoor showers. Facilities include a 25 metre lap pool, on-site restaurant, beach club and fitness facilities. The Wolas Villas & Spa is located amidst the dazzling Seminyak tourist area that is a premier shopping and entertainment destination. It is only a 15 minute drive from the airport and less than 30 minutes drive to destinations like Denpasar City, golf courses and Sanur tourist resorts. 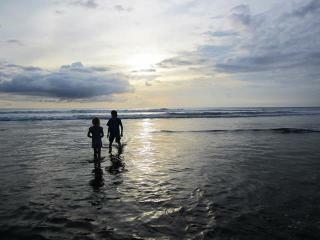 Even, the legendary Kuta Beach is only 10 minutes drive away. 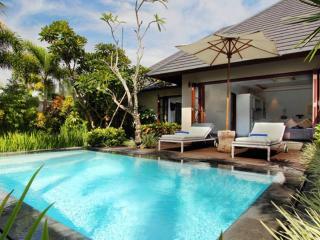 This resort features 1 and 2 bedroom self contained villas, each with a private swimming pool. Facilities include a restaurant, free WiFi day spa facilities. Uma Sapna is ideally located in the chic and stylish area of Seminyak, well known for restaurants, club, shopping areas and vibrant night life. Ngurah Rai International Airport is only 30 minutes from this Bali accommodation and within few minutes to the white sand beaches. A luxurious villa resort, each is beautifully decorated with modern interior and providing a blend of Balinese atmosphere at the same time. The resort offers amenities like dining at your own private villa, exclusive spas, yoga, meditation and healing arts. A mesmerizing resort that is situated in a perfect location that gives easy access to the beach, it will prove to be an excellent choice of stay. Viceroy Bali is a boutique hotel nestled in spectacular unspoiled countryside with unrivalled valley views, only a few minutes from Ubud. Featuring private pool villas, a fine dining restaurant and day spa with amazing views this Bali accommodation exudes luxury and privacy. Viceroy Bali is located on the slopes of the Petanu valley, near the village of Nagi and offers spectacular views of the river gorge and terraced paddy fields beyond. Villa Air Bali is a boutique resort situated in the heart of Bali's fashionable Seminyak area, just a 30 minute drive from the international airport. This Bali accommodation is comprised pool villas, all of which feature a private swimming pool, living and dining areas and a kitchenette or full-equipped kitchen. 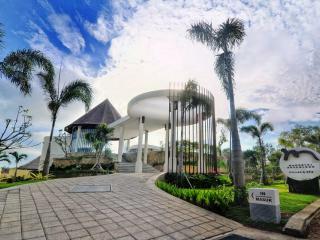 The Villa complex has Mata Air Restaurant, Spa Air, library, pond, swimming pool, and parking. Villa Coco is a boutique Bali hotel located right in the heart of Seminyak, close to shops, a safe patrolled surfing beach, beachside restaurants and nightlife. 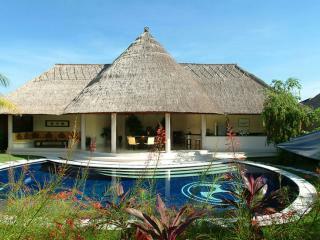 Villa Coco features self contained 1 and 2 bedroom bungalows and villas all featuring magnificent thatched roofs. Facilities include a swimming pool with pool bar, beauty and massage treatments, babysitting and a tour desk. 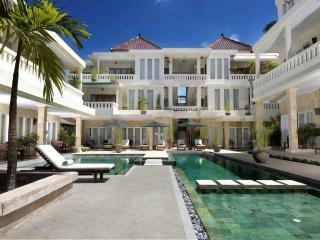 Villa Coco is also located only a short drive from Legian and Kuta, the shopping and nightlife hub of Bali. Villa Jerami consists of luxury 1, 2 and 3 bedroom villas, with each villa featuring a dining room and family room. Facilities include a state of the art spa, sun deck and swimming pool and restaurant. 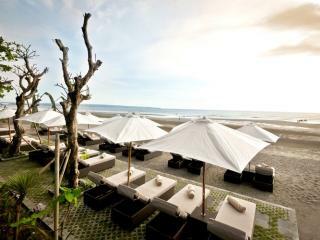 Nearby you will find an array of restaurants, night clubs, bars, cafes and shopping centres of Seminyak. Jerami Villa is ideally situated close to Legian and Kuta and other tourist attracting making it an ideal place to base yourself on your next Bali holiday. 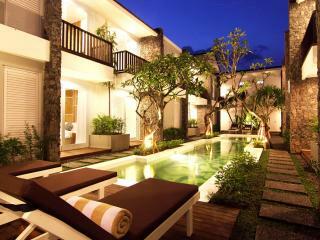 Located within walking distance of Sindu Beach in Sanur, is the luxury private resort of Villa Mahapala. This hotel is designed with a zodiac theme and offers guest a secluded relaxing holiday. Each of the luxurious villas has its own private plunge pool and fantastic amenities including satellite TV and a DVD player. Guests can also enjoy the gym, and on site restaurant with delicious dishes. 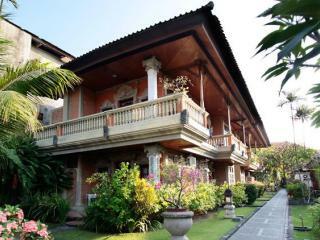 Villa Mahapala is located 20 minutes from the International Airport and the entertainment of Kuta, and 5 minutes away from Denpasar's popular shopping area. 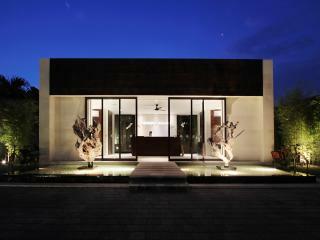 Villa Seminyak Estate & Spa is just a 5 minute walk from the heart of Bali's trendy and chic Seminyak district. This Bali resort provides private accommodation with a combination of traditional and private pool villas making this the ultimate location for your next Bali holiday with family and friends. Each villa is tastefully decorated to evoke a sense of peace ensuring that you feel totally relaxed in your premier Bali accommodation. 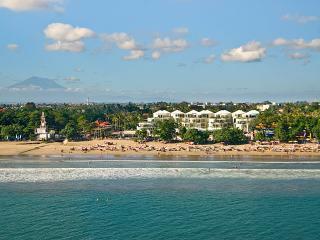 W Bali is ideally located in Seminyak, right on the beach and only a short drive from the centre of Kuta. This Bali accommodation offers guests luxuriously designed rooms and suites, featuring modern furnishings and some featuring spectacular views of the ocean and famous Bali sunsets. Facilities include restaurants, bars, day spa, large swimming pool and a fitness centre. 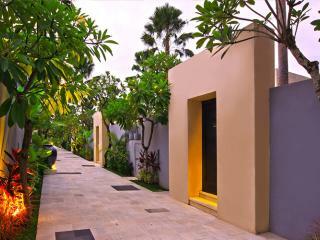 Also a short walk from the resort is an array of restaurants, bars, cafes and boutique shops of Seminyak. 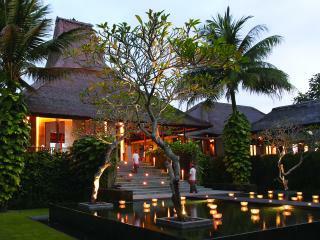 Wapa Di Ume Resort & Spa is only 5 minutes away from the heart of Bali's cultural and artistic area, Ubud. The resort is surrounded by local rice fields offering guests a unique experience. 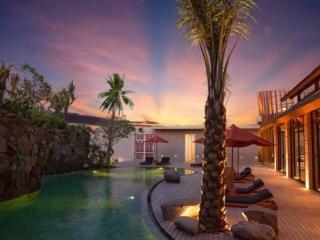 This Bali accommodation features many facilities including a swimming pool, yoga room and day spa. The resort also offers a free shuttle into Ubud. Wapa Di Ume Resort & Spa is an ideal choice for those after something a little different or for those who want to have time out of the hustle and bustle of the more tourist popular areas such as Kuta, Legian and Seminyak. Warwick Ibah Luxury Villas & Spa offers guests a choice of 17 spacious villas and suites that are ideally located on the sloping valley of the Campuhan River in Ubud. Facilities include a restaurant and bar, swimming pool, health spa and beauty centre, a gift shop and tour desk. Just over an hour's drive from the International Airport, this Bali accommodation is the ideal choice for a peaceful and relaxing getaway to the cultural hub of Bali. 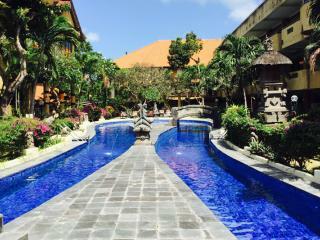 The town centre of Ubud is a short walk away, where you will find an array of galleries, restaurants, shops and cafes. White Rose Kuta Resort Villas & Spa is set amongst 1.6 hectares of tropical lush gardens and temples and offers good quality, comfortable accommodation. This Bali accommodation is centrally located, just off Jalan Legian, the main street of Kuta boasting a variety of shops, restaurants and nightlife, and just 500 metres to the beach. Wina Holiday Villa is just a short stroll from the beach at Kuta and popular Legian Street filled with eateries, shops and nightlife options. 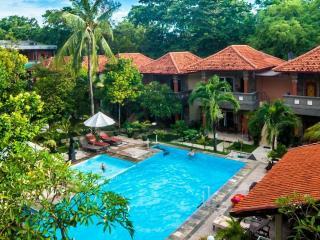 Wina Holiday Villa offers comfortable accommodation in 180 rooms and suites all surrounded by lush tropical gardens. Relax with a massage at the day spa, or enjoy a swim in the pool, with a refreshing drink from the pool bar. The restaurant is open 24 hours and serves both international and local cuisine. For convenience Wina Holiday Villa provides a shuttle service to Legian Street. eqUILIBRIA SEMINYAK offers guests a choice of 1 bedroom villas right in the heart of Seminyak, surrounded by rice paddy fields, and only 100 metres from boutique shops, restaurants, bars and cafes. Each villa features its own private pool and includes flat screen tv, dvd player and iPod docking stations. Guests can enjoy complimentary access to Bali's premier country club, Canggu Club, and resort facilities such as a day spa, private butler service and tour desk. 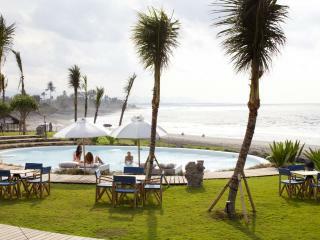 eqUILIBRIA SEMINYAK is also only 15 minutes from Seminyak Beach.